Metcut features several test machines for conducting sliding and fretting wear from 1 to 30 Hz. in short-stroke, high-temperature conditions. We conduct wear testing on a variety of equipment, but primarily with a moving shoe on a stationary block test interface. 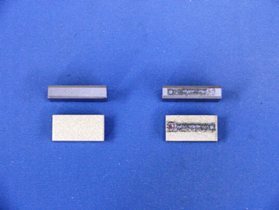 Typical sliding wear test capabilities are temperatures of 75°F to 1800°F, test stresses up to 120 ksi depending on the material performance, and stroke ranges of 0.002 in. to 0.25 in. Sliding wear tests usually are conducted at cyclic frequencies of 1 Hz. due to the high crush forces. Typical fretting wear test capabilities are temperatures of 75°F to 1100°F, test stresses up to 3 ksi depending on material performance, and stroke ranges of 0.002 in. to 0.010 in. These tests typically are conducted at 30 Hz.